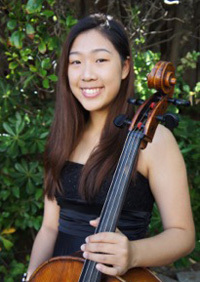 Prometheus Orchestra is proud to announce that Cellist, Sarah Chong, Co-Winner of the 2018-19 Khuner Young Artist Concerto Competition, will perform Tchaikovsky’s Variations on a Rococo Theme on May 19, 2019. Sarah, age 17, has been playing the cello since age 9 under Jihee Kim. She currently is a junior at Archbishop Mitty High School in San Jose. Ever since a young age, she has been competing in various competitions. In 2018, she was selected as the first place winner at U.S. Open Music Competition, Diablo Valley College/Holy Names University Young Artist String Competition, and the American Fine Arts Festival Concerto Competition. In 2017, she was awarded the alternate winner in the state division of the Music Teachers National Association Competition. She has placed in numerous other competitions in the last four years including the Palo Alto Philharmonic Concerto Competition, the Young Artist Concerto Competition for the California Youth Symphony Senior Orchestra, and the American String Teachers Association Competition. In August of 2018, Sarah was the winner of the Korean-American Music Supporters AssociationYouth Symphony Orchestra Young Artist Competition where she performed the Haydn Concerto No. 2 with the orchestra. Sarah’s summers are always filled with music. In the summer of 2017, Sarah attended the Aspen Music Festival and School where she studied with professor Richard Aaron. She also studied with professor Hans Jorgen Jensen at the Meadowmount School of Music in the summers of 2014 and 2015. In 2018, she travelled to Europe with the California Youth Symphony, where she had been the assistant principal for two years. Sarah has been a member of the HOP3BOX Benefit Orchestra for three years and helped raise funds for children in Nepal and Haiti. In her free time, she enjoys playing the piano, as she has often accompanied children musicals and plays at church, and also loves watching movies with family and friends. Sarah is an avid writer, as she loves to write in her spare time and has also placed in essay contests.